This was a beautiful property very close to the lake. Loved our trip! The cabin I initially wanted to rent did not accommodate the number of people in our group. I reached out to the staff and they helped me find several options for cabins that would work for us. I really appreciated the help, and it took the guess work out of finding the perfect property for our family. Thank you! Our expectations were exceeded! This cabin is even nicer in real life than in the pictures and the location is very good. Close enough to easily walk to shops, go-carts, the tram and the lake, yet set back at the base of the mountains to give it a very private and peaceful feel. Our large group had no trouble relaxing as the big deck accommodated us nicely with plenty of chairs and a big table for eating meals and hanging out enjoying the view. Absolutely loved this property. It worked out great for us and everyone had a very nice time. We liked the ease of check in/out with the key pad. It made it very easy to just show up and start enjoying the property. The home was well equipped with extra blankets and towels, as well as plenty of outdoor chairs for our large group. Loved the location and the view of the tram and hillside from the deck was great. We had fun looking at hang gliders and tram riders through our binoculars. The eastern exposure made sitting on the deck in the morning the perfect place to sip on morning coffee in the early sunshine! Would definitely recommend this cabin and would stay here again myself. I had the opportunity to correspond with Jan on several occasions. Jan is very courteous and helpful when we had questions on a future rental and took care of our needs. Your team of professionals are the best when compared to the other resort at Wallowa Lake. No question Wallowa Lake Vacation Rentals are the best in customer service and fine accommodations compared to other resorts at the lake. We have rented from Wallowa Lake Vacation Rentals for years. The Ponderosa Pine cabin met our expectations on cleanliness, location, amenities. Our family would not hesitate to rent this home again. We had fun fishing and just relaxing on the deck. We had little need for interaction but did meet the check in person briefly and had a very nice conversation. GREAT!!! We have always enjoyed this area and to be able to spend a week with all of our family to celebrate our 50th wedding anniversary was the absolute peak. We have already mentioned your organization to friends who may also visit. When we had a small issue the staff came immediately, . They were very efficient. We loved everything and will definitely return again. Customer service was great to work with and quick to respond to any questions. What a great little house at the perfect location! It was sooo clean and we taken care of. The #19 cabin was wonderful. The kitchen was stocked with all the tools needed for cooking and preparing meals. The beds were comfortable The table was perfect for the group to work around. The weather was cool, so didn't spend time outside, but I was a great time. Thanks! I would love to see early summer rates continue for the next year. I noticed that summer rates begin once school is out. We loved it! It was perfect for us and we hope we can come again! My family stayed in 32 and 32A. We came for my daughters wedding. We Loved our stay - Loved Joseph and ALL the people we met. Everyone was very helpful and kind. We will definitely come back!!! Loved that all the cabinets in the kitchen were labled - made finding things very easy. We had a great stay at Pine Cone Cottage. It was an older property (as described) so we felt a little like we had stepped back in time. We had everything that we needed and the setting was peaceful and quiet. Thanks for everything Jan!!!! It is truly a blessing to have a service like Wallowa Lake Vacation Rentals. Jan walked me through every step in choosing which cabin would fit my needs. The cabin was perfect. Now... if only Jan could control the weather!!!!! Great memories! As soon as I got home I made a vacation video to share with my family. The team was great. We had a couple issues with wifi and the response was quick and there was a simple fix. This is our second time at Wallowa Lake and using you guys to rent property. The customer service is wonderful and you all have such a quick response time. You make wanting to come back year after year a no-brainer! Both locations we've stayed were great and this last one right off the lake, with our own dock, and ample room for 10 people was amazing!!! We look forward to next year! These are some of the friendliest people you'll find anywhere. Great service from everyone and I actually talked with 3 different people. They were all super helpful and friendly! We loved staying at #17. Having the river right outside our door and the feeling that we were tucked in was a wonderful experience. I definitely would like to make this a yearly event! It was very easy to rent the cabin and when we needed to add a dog to our stay, it was extremely quick and painless to do so. I appreciate the ease and efficiency of the process. We had a wonderful and relaxing time at the cabin. It was a family get together and it was a great vacation. Since I live in Las Vegas, the mountain air was refreshing and watching the deer brought back the good old days when I lived in Eastern Oregon. Loved the area and if I get a chance I will be back. Thank you for a great vacation. Weve stayed at a few properties at Wallowa Lake and this was by far our favorite. It had everything we needed and is very well maintained. The location was nice and private and having the separate cottage and sweet little outdoor area with a nice grill was just perfect for our family. We will definitely stay here again. Thanks so much to the property owners for sharing this special place and thanks to the management team for doing such a great job taking care of it! #23 two bedroom with large front room and kitchen. 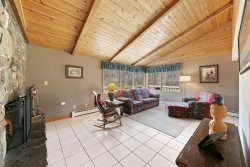 Secluded yet right on the lake with large deck and boat dock. Very comfortable inside with large screen TV (with Netflix). And unforgettable vacation. Thank you so much. Amazing every year we return. We had pleasant experiences with your staff! Great big roomy cabin. Beautiful views from multiple windows. Good trails and hiking nearby. We loved this place. We enjoyed this place. It was perfect for just my husband & me. Its nice there is a bathroom upstairs. Super friendly, helpful, and quick response time. Fun & comfortable, lovely decor, well appointed, and great location. Loved it! Thanks!